The Lightning Saga - Part One: "Lightning Lad"
As the Justice League and the Justice Society get together to train and spar at the League's headquarters Batman and Black Lightning discover that the villain they thought was Trident is actually Karate Kid, a member of the Legion of Super-Heroes. 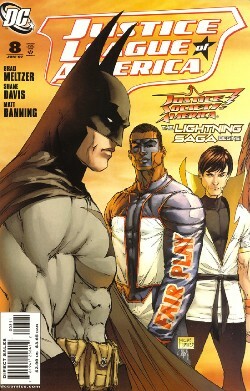 The Karate Kid and Batman fight and with Black Lightning's help Batman manages to subdue the Legionnaire. They take him to the Justice League headquarters and after some serious prodding he starts to remember who he is. In 1948 Dolores Winters, in reality the Ultra-Humanite, receives a visit in his/her hospital room from two strangers who offer her/him a chance to live past the massive brain hemorrhage that will kill him/her the next day. Back in the present Power Girl brings Starman to the League's headquarters. This brings Karate Kid out of his hypnotized state and remembers that he isn't the only member of the Legion trapped in the past. Soon the full assemblage of the League and the Society come together and decide that the best course of action to find the other five members of the Legion is to split into teams. Story - 4: In the interest of honesty and fairness I would like to state right here at the beginning that the chances of me being extremely biased with the next couple of issues are high. I'm going to try my best to be fair and objective, but at the same time there aren't many things involving super hero comics that tap into that fourteen year old fan boy that lives inside me as a team-up between the Justice League and the Justice Society. I just flat out love the concept. They haven't all been good but there is something about the two most important super-hero teams in comic book history (yeah, I wrote that, argue if you feel like it) banding together that is just plain neat. So unless this current team-up bombs horribly I will probably be heaping it with praise while trying to maintain some level of objectivity. We'll find out together how that goes. 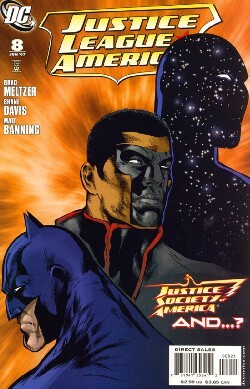 There were two aspects of this issue that made it work as an introductory chapter to a JLA/JSA crossover. First, it brought the characters together in a very unassuming way. This could mean a fancy dinner (which has happened) or, like this issue, hanging out and sparring. The whole "capture the flag" bit was a lot of fun but not as much Mister Terrific playing Green Lantern and Black Canary against each other. It wasn't earth shattering and aside from Red Tornado's gaff there was no real danger. For me this is always the best way to go. It allows the characters time to interact, allows the writer a chance to play with the characters and allows the readers to see the heroes just sit there (or stand there or fight there) and talk (or fight) with each other. And I like that kind of thing, but that could just be me. What this issue also did was let the anticipation build. The mystery of the Karate Kid played out organically and while I don't buy into Batman doing as well as he did it was still kind of cool to see Batman and Karate Kid duel in the Batcave. Add to that the scene where they brought Starman in (and the funny bit where Batman realizes what Mister Terrific is doing) and then assembled the group and I, as a reader, got the sense that this was going to be big and probably a lot of fun. This issue felt like a full story, more so than the previous arc's chapters though that wasn't a complaint but merely an observation. It had a beginning, a middle, a digression into the past and an ending and really felt like the old school seventies League that Meltzer has professed to be fond of. And it ended with everyone splitting into teams. This may have been the second time that particular trapping was used, but it really worked here. So outside of some minor, fannish complaints (like the Batman vs. Karate Kid thing) I thought this story kicked off in fine style. While this may not be the first time the JSA and JLA crossed over into other titles to tell a story (technically that happened back in 1982 with "Crisis on Earth Prime" which took place in JUSTICE LEAGUE OF AMERICA and ALL-STAR SQUADRON) I think this is probably going to be one of the best team-ups in the history of that convention. So far I'm happy and very satisfied. And now, in true crossover fashion, I hand the baton to Neal to review the next chapter of this arc. Art - 4: Shane Davis and Matt Banning did a solid job with the art on this issue. Drawing this many characters has got to be maddening, but everyone managed to retain a distinctive look. The layouts were fantastic and while they had a similarity to the previous arc's art it also had a distinctive look. There was consistency, which was nice, but the art stood on its own at the same time. The double page spread of the League and the Society getting together was definitely my favorite image from the issue. As much as I like Davis and Banning's take on Karate Kid and the other characters this was it for me. Any problems I may have had with the art (which I did, but only because of the scratchy quality to the artists' work that took some getting used to) evaporated with those two pages. They put a huge smile on my face, and it wasn't just the dialogue. The art put just as much character into the heroes as the writing did. So between the great character designs and the meeting of the two teams I was very impressed with the art this issue. Cover Art - 5: (Standard Cover by Michael Turner and Peter Steigerwald) This cover is just a solid piece of art. While I thought that Turner and Steigerwald's cover work has been hit and miss this was a definite hit. I like the thought of the three of the better martial artists of the three teams on a cover together. Also it makes for a good impulse buy image. "Batman? Mister Terrific? Karate Kid? Together? I need to check that out!" Turner also drew a nice version of the Karate Kid. I don't know why I like that costume as much as I do, but it is what it is. Cover Art Alternate - 4: (Alternate Cover by Phil Jimenez and Mark Chiarello) Not a bad cover, but definitely a variant. The Turner/Steigerwald cover was a lot stronger. This was a nice piece of art, but not the best cover I've ever seen.